*To make the soda go flat, twist off cap, and let the bottle stand at room temperature overnight. Place 1 cup soda in a large bowl. Sprinkle gelatin evenly over soda, and let stand to soften, about 5 minutes. Place 2 cups soda in a small saucepan over medium heat. Heat until just before a boil. Add the softened gelatin, stirring to dissolve the gelatin completely over the heat, about 2 minutes. Remove from heat. Add the remaining soda and food coloring, and stir to combine. 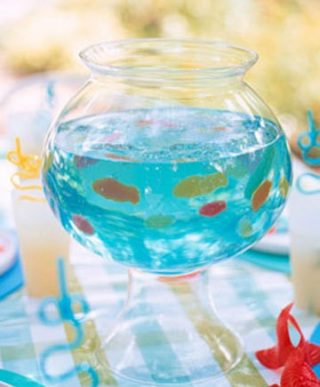 Pour the liquid into the fish bowl. Using a damp paper towel, carefully remove any bubbles that have formed on the surface. Transfer to the refrigerator to chill overnight. When ready to serve, use a sharp knife to make vertical slits in the gelatin; insert the fish in a random pattern to make it look as though they are swimming in the bowl. Keep refrigerated until serving. Serve within 6 hours.